The group made its way deeper and deeper into the darkness. The passages got narrower and wetter and the floor slick with running water. The sound began as a distant rumble at first and slowly grew to a roar in all the ponies' ears. The narrow passage suddenly opened into a vast cavern lit by a strange glittering light shining through a column of falling water. In its center a waterfall poured its waters from unseen heights down a seemingly bottomless pit. Stalactites fused into columns hundreds of hooves high with water streaming down them. The air was filled with swirling droplets. The ponies made their way around the circumference of the cavern on a narrow slippery ledge. Fluttershy and Rainbow Dash, who had been walking side-by-side with their bodies pressed together and their wings entwined had to walk single file. Princess Luna followed Spiral, her head held high. The ponies passed around and behind the waterfall into a passage whose ceiling was covered with dripping stalactites. The passage was not long and at its end lay a beautiful golden light. After spending so much time in the strange darkness the ponies' eyes had to adjust to the sudden brightness. Spiral stood aside and Luna was the first to step forth into the light. The other ponies followed her and immediately bowed, causing a pile-up as they emerged. The chamber was shaped like a vast cathedral of living stone. Its walls lined with natural columns of limestone, its floor paved with shining golden stones, the ceiling lost to sight. In the center of the space was a single circular platform and on it, a shining figure bound by the hooves with heavy iron chains. Beside her sat a much smaller figure, her coat reflecting the golden light. “Greetings, sister,” the shining figure said, her voice echoing in the chamber. Princess Luna trotted up to her sister and nuzzled her cheek. Celestia looked glorious, her body shining with the light of the sun and her mane and tail flowing with the colors of the most gorgeous sunrise. “It's so good to see you again Tia,” Luna whispered. Luna stamped, her nostrils flaring wide. “You have no business holding my sister here!” she snorted. Luna's mane and tail exploded with burning stars. Comets sailed through its depths. Her horn came alive with blue-black light. “The sun sets and she must rise again. If that means I must make a sacrifice, then I will,” she snorted. “Luna, no!” Celestia cried, “You can't! The other ponies rushed up and gathered around the stone disc. Applebloom burst into tears. 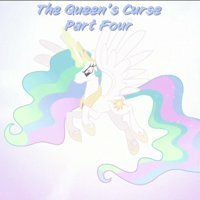 She tore at Celestia's chains with her hooves and teeth. A shower of tears poured down and splashed onto the dark iron. Thin trails of smoke rose from the chains. The filly cried and cried, holding onto Celestia's leg. Suddenly there was a snapping sound. The shackle around Celestia's hoof crumbled away. “Chains forged of hatred are dissolved with bitter tears,” Celestia said, “Only an innocent could break my bonds and so she is.” She looked down lovingly at Applebloom. The filly tore at the iron chains, her tears soaking them and her hooves tearing them apart. One after another the bonds parted. As they did Celestia's light became greater. It filled the chamber with light until no shadow remained. The six ponies gathered around her as the gems on their chests began to glow with their own light. They rose into the air encircling the princess in a cone of swirling light. The dark stallion slinked away, hiding from the flood of magical energy. Spiral stepped forward to watch, his eyes once again the bright blue of a clear sky. Granny Pinkie spread her wings with tears in her eyes. Applebloom tumbled head-over-hooves when the last shackle broke. Bits of crumbling iron skittered across the stone. Princess Luna scooped her up and put the filly on her back. “Thank you, child,” she whispered. Celestia rose into the air surrounded by the Element bearers. Luna flapped along behind with Applebloom on her back. The group rose higher and higher. No ceiling impeded them. They rose higher and higher until the top of the chamber became a passage wide enough to admit them. Granny Pie stood waving her hoof. She grabbed Spiral and wrapped a wing around him as her granddaughter floated out of the chamber high above. The shining party passed through narrow caves and over vast galleries filled with milling ponies, their dark eyes turned upward to watch the sun shine in the underworld. Their wailing voices were silenced as the princesses passed overhead. They rushed along above the river until they reached the crumbling dock. Celestia's hooves touched the ground once more. The group stood before a narrow cave at the base of a spiral passage leading upward. The princess' light dimmed. Her sunlight gave way to the dark glow of the netherworld once more. Celestia turned to look at her sister. Applebloom tried to hide behind Luna's vast flowing mane. “Thank you, sister,” Celestia said lovingly. She kissed Luna on the cheek. Then she reached into the mane of night and pulled a golden filly out from behind it. “And thank you, Applebloom,” she said gently. The filly's face was streaked with tears and her mane wet and tangled, her hooves blunted and cracked. The tattered remains of what was once a bow hung behind her ear. “I'm sorry,” she said. “I know that, dear Applebloom,” the princess said, “and thank you for setting me free.” She kissed the filthy filly on the top of her head. Celestia nodded and stepped into the spiral passage, leading the group up and up and up. The light of the underworld faded away and the darkness became greater. Celestia cast a small circle of light ahead of her as they moved upward. Then a jagged doorway appeared with moonlit grass beyond it. The ponies walked out into the moonlight. Celestia's coat gleamed in the opalescent rays of the gibbous moon which lay low near the horizon. “There's nothing like some time in the underworld to set a pony back on her hooves,” she said, “I'm off to raise the sun.” Without another word the princess rose into the glittering night sky. All the gathered ponies looked around in amazement. Luna floated her crown and pectoral off the ground and put them back on. She looked more regal than ever in the moonlight. Cerberus lay on the grass snoring from two muzzles. The third was making a whining noise and a hind leg was kicking. Applejack sat and groomed Applebloom's mane as best she could with her teeth. “You need a bath and a good brushing, little lady,” she said. “Oh seriously,” Rarity said, “You're such a glutton.” She looked at herself and gasped. “I'll see you all later. I simply must do something about my mane. It's such a wreck,” she said before running off toward Ponyville. Rainbow Dash nuzzled Fluttershy's long mane. She was surprised when a chicken's head popped up out of the tangled pink mess. Fluttershy suddenly looked embarrassed. The hen flapped free and pecked in the grass. She came up with a juicy grub that shined in the moonlight for a moment before she swallowed it. “Um,” was her only response. Fluttershy made a squeaking sound and hid behind her soggy mane. Rainbow Dash kissed her on the cheek and wrapped her hooves around the shy mare. Luna stepped to Fluttershy's side and watched the hen pecking in the grass. “Just be careful. That hen's eggs could have unusual magical properties,” she said. Twilight nodded. Rainbow and Fluttershy were too busy making out in the grass to notice. Twilight bowed deeply to the princess. “I won't, Princess!” she shouted. Twilight collapsed on the ground as the dark chariot departed. She rolled over onto a checklist that had been forgotten in the crunchy frozen grass. “Ugh,” she sighed, “What a day and what a night. I'm sooooooo glad it's over. I'm not even interested in finishing the checklist.” She looked at it. The last item, “Rescue Princess,” was left unchecked. “Mind dropping me off at the library?” Twilight asked Pinkie. The pink mare nodded vigorously, making her mane bounce. Applejack and Applebloom climbed into the wagon beside Twilight and the other two snuggled up in the back with Henrietta and a sack of cream puffs. Pinkie gobbled down half a pie, finished off the keg of cider, and hitched herself up. The wagon rose into the sky drawn by the rosy-hued pegasus as the first rays of dawn light broke the horizon. Twilight Sparkle slowly made her way down the passage. Trepidation gathered in her heart. Her hooves clicked on the polished marble. She walked past portraits of great unicorns of the past. At the end of the hallway was a huge portrait of Princess Celestia framed in gold looming over the passage. Her knees began to shake as she approached her destination. Memories of the long past swam through her awareness. Twilight shuddered. She reached out to knock on the door but her hoof barely touched it. She could hear the voices of little foals' laughter coming from inside. Her heart shrunk inside her. She reached out again and actually knocked on the door once before somehow missing the great mass of wood on the second knock. As she was about to knock again the door popped open. A tiny green unicorn looked up at her for a moment before calling out in a shrill voice, “Miss Starshine!” The little colt ran back to his place in a circle of little ponies sitting on the floor. Twilight shyly peered inside and was quite surprised to see all the little ones gathered in a circle around Zecora. The zebra sat with her hooves on a thick book. A prissy looking yellow unicorn who had to be Miss Starshine motioned for Twilight to sit. Miss Starshine shook her hoof at a yellow filly with powder blue eyes who looked very much like her. The pages glittered as they flipped back. The book fell open at a story called Sheba the Zebra and the Cheetah Diva. Twilight settled down in the circle actually looking forward to her visit to magic kindergarten and story time. Two unicorns trotted down the sidewalk, one purple with a pink streak in her mane, the smaller one violet with a pink and red streaked mane, her tail braided in a spiral like a candy cane. A wooden box with gauges and a long pink plume sticking out of it floated in the air ahead of them. A figure like an oversized gargoyle with a bird on its shoulder watched the pair from a ledge high on a building. “What are you getting on the Pinkie-Scope, Ember?” Twilight asked. Both unicorns braced themselves and watched the ponies walking in both directions. Neither saw anything unusual. There were no ponies heading in their direction. An old stallion at a hotdog cart looked at them curiously. Both ponies ran into the street, causing a wagon bus to swerve. The driver angrily honked his tinny horn. Twilight levitated a manhole cover and they both dove into the opening. The iron lid fell back into place with a loud clang. The unicorns ran along a narrow ledge beside an underground ditch filled with foul water. They could hear running hooves far ahead. Ember floated the Pinkie-Scope into her saddlebags. The sound of hoofbeats from the tunnel ahead continued unabated. Twilight and Ember slid to a stop at an intersection. Water dripped from high above. In a moment they were running again, still following the sound of running hooves. The tunnel led them out onto a catwalk. On the far end a shadowy figure in a blue uniform ducked through a doorway clearly marked 'Dangerous — No Admittance'. The unicorns' hooves clattered on the rusty metal. Twilight paused for a moment before rushing through the doorway with the No Admittance sign. Ember rolled her eyes. A ladder led them up into a room full of equipment dominated by a huge steam boiler. The sound of another door closing came from the far end of the room. The two ran around the boiler and dodged moving belts and pushrods. Twilight looked down a ladder and saw the pony in the blue uniform running away. She slid down the ladder, her hind hooves sliding down the sides of the rails. Ember followed directly behind. The brick lined access tunnel led down into a large room whose floor was flooded with water and floating debris. The mysterious pony ahead slogged into the hock-deep muck. The slack-jawed thing looked at her with fogged eyes for a moment before continuing toward the other side of the chamber. “I don't think he's calling his lawyer, mom,” Ember said sarcastically. While they were talking the zombie crossed the chamber and started climbing into a drain on the other side. The decomposing stallion slid down the tunnel and out of sight. “Oh! I guess we'll have to cross this awful pool of…” Twilight whined. Twilight scowled and stepped into the muck. What had looked like a floating log suddenly shot forward. It opened its tooth-lined jaws and snapped at Twilight. She scrambled out of the water barely ahead of her pursuer. Ember launched a tiny fireball from her horn. It passed into the alligator's mouth and out through the side of its head. “Where's the stupid thing's brain?” Ember cried. She launched another fireball. This one tore a hole in its foreleg. Rotten alligator meat splattered onto Twilight's mane. The thing reared up, opening its maw again. Twilight let loose a torrent of flame from her horn. It incinerated the creature's head, leaving its lower jaw still attached. The creature collapsed in a heap and slid back into the water. Twilight poked it with her hoof. “Not only is it dead,” she said, “It was already dead before we got here. The last thing we need is undead alligators in the sewer. Hopefully there aren't zombie rats too.” She shuddered. The partly decomposed pony in a tattered blue subway engineer's uniform reached the end of the tunnel and squeezed between the iron bars blocking it. His hooves splashed in a pool of mucky water as he trotted out into the sunlight. He came face-to-face with a phoenix sitting on a piece of rusty rebar. “♫♪!” it chirped, looking up into the sky. The zombie looked at it blankly. Then a shadow fell across them both. The undead creature gazed upward as a huge winged form descended from the sky. The creature landed and wrapped its wings around itself dramatically like a long purple cape. “What took you so long?” the dragon asked in a deep voice. He grinned with a mouth full of sharp teeth. “Hasta la vista baby,” he said, before opening his mouth wide. A green glow lit deep in his throat. The scaly creature breathed out a torrent of green flame engulfing the undead pony. Ember and Twilight slogged down a long tunnel partly filled with running water. Their coats and manes were matted with muck. Sunlight shining through iron bars became visible at the far end. Another light appeared at the end of the tunnel. It was a burst of bright green. “Oh no…” Twilight said a moment before the flames engulfed them. Green fire and burning zombie limbs roared past. When the fire subsided both mares were steaming. Muck and alligator blood hardened like clay in their tangled manes. A partly burned carcass lay in the water, which was now boiling around their ankles. Twilight stepped around it and motioned for Ember get clear before she torched it with a stream of her own flames. Twilight and Ember stepped out into the light. “I really, really need a shower now,” Twilight said. Spike grinned, trying to look innocent. “So, um, he got burned pretty good, eh?” he asked. “Real good,” Twilight said, “Now I'm going back to the hotel to wash up.” Spike knelt and Twilight climbed onto his back followed by her daughter. The Luna Signal! Quick, to the chariot! Our mistress needs us! Pinkie and Granny Pinkie baked pies in the underworld? Where did the eggs come from? (yes, another Doctor Who reference.) Fluttershy's flock of dead chickens of course! Eggggggs! Yes, hot dogs. They're totally canon. Spike grown up and with wings? He has to grow up sooner or later. At last the final installment. It's been a long journey. As with the last installment one of the OCs has a definite voice; the voice of the stallion with the blue fire mane is Jay Leno. The last page is demented !